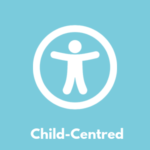 Our child-centred approach means that we put students at the heart of all policies and practices and involve them in decision-making where appropriate. Students don’t wear uniforms. Educate Together school communities opt for agreed dress codes instead of uniforms. The dress code is developed by parents, teachers and students together, promoting safety and equality at school. This child-centred approach empowers the individuality of the students while respecting their identities. Respect is at the core of pupil teacher relationships. Teachers make a special effort to teach children to question the world around them and to express their own opinions. Students, staff and parents are addressed by their first names. In our second-level schools, students work and learn together in mixed-ability classes for the majority of subjects and teachers use active teaching approaches to enhance student engagement. Students were also consulted in the design of the second-level Ethical Education curriculum.